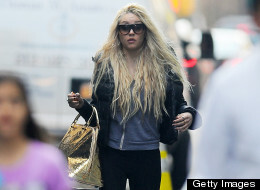 Amanda Bynes may be finished with acting, but the 27-year-old headline-maker has a new career plan for herself. Bynes, who has a penchant for using Twitter to do everything from declaring her love for a certain rapper to defending herself against the paparazzi and media, toattacking other celebrities, took to the social media website to announce her plans for the future on Monday morning. The tweet, which largely focused on her recent run-in with the NYPD, closes with Bynes looking towards a career in music. "Look forward to seeing me in music videos!" Bynes wrote. "I'm getting in shape and getting a nose job! I'm looking forward to a long and wonderful career as a singer/rapper!" If she does pursue her dreams of becoming "a singer/rapper," it won't be the first time that Bynes has tried her hand at music. Her appearance in 2007's "Hairspray" remakeincluded her vocals on the film's soundtrack.